Time seems to have flown by as it is over 18 months since I wrote a post entitled – Famille Labruyere a new and exciting relationship. Working with the wines from the three – Domaine Jacques Prieur, Domaine Labruyere and Chateau Rouget, soon to be four with Champagne Labruyere coming soon – estates has been a lot of fun. This particular tasting was to focus on the Moulin-a-Vent wines from Domaine Labruyere and was very well led by Nicolas Mielly who got the balance between information and passion just right (not always easy!). A few key dates for Domaine Labruyere. The 2014 vintage: Budbreak was early, suggesting an early vintage but flowering was about average, beginning early April. Cooler weather in July and August slowed down véraison which started at the end of July. The conditions in July and August, predominantly cooler than average, brought the risk of disease. September, happily, was sunny, hot and dry with higher than average temperatures and very little rain. Picking began on the 11th September, all harvested by hand into small cagettes. The bunches were small, the grapes, big, ripe, healthy and juicy. Harvest lasted 10 days. A note on scoring…Recently I have been slightly “mucking about” with scoring a few tastings/wines out of 25 rather than 20 as I tend to find that the 16-18 range gets used the whole time when scoring out of 20 and therefore the differentiation is less. I used the 25 point scale for this tasting. There is something of a threshold to the 20 out of 25 level but I feel it is a more useful threshold than the 90 out of 100 mark. It was a very good tasting. 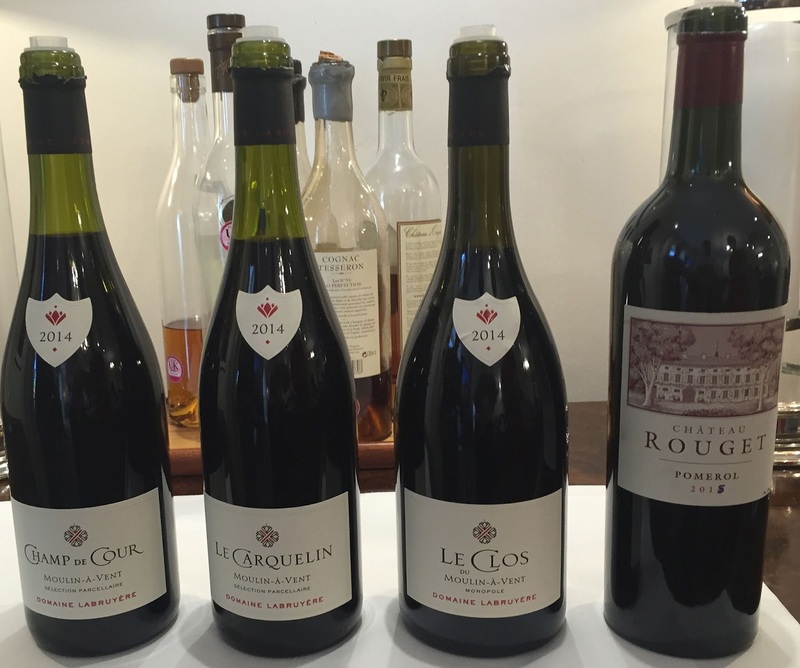 I am the first to admit that I had rather dismissed the wines of Beaujolais (much to the frustration of mates in the trade) until I came across these. It was too good an opportunity not to re-taste the Rouget 2015, last tasted in Bordeaux during this tasting trip. Chateau Rouget 2015 – 85% Merlot and 15% Cabernet Franc with 30% new oak. In 2015 60% of the wine made it to the Grand Vin the remaining 40% being designated as “Le Carillon de Rouget”. It is a superb wine, arguably one of the very best value buys of the whole campaign at about £350 a dozen (well I bought it). Rich and full but not without balance it is wine I intend to leave a good while!